Resistance training is essential to developing strength and maintaining muscle tone. When designing your strength-training program, focus on all muscle groups to avoid muscular imbalances and promote a well-conditioned physique. Two exercises to strengthen your biceps, a major muscle group in your arms, are the dumbbell curl and incline dumbbell curl. While both exercises target the biceps, there are several differences in how to perform these two movements. Dumbbell curls can be performed while either standing or sitting on a bench or stability ball. Begin by holding a dumbbell in each hand with your arms extended toward the floor. Slowly lift the dumbbells by bending at the elbow, keeping your upper arms pinned to your sides. Your palms should face toward your shoulders. Focus on contracting the biceps by squeezing the muscle before returning to your starting position in a slow and controlled manner. Incline dumbbell curls are performed on an adjustable bench. Situate the bench at an inclined level of 45 to 60 degrees. Sit back on the bench with the dumbbells held down by your sides. Holding the upper arm in a stationary position, curl the dumbbells toward your shoulders with your palms facing up. Stop when the dumbbells reach shoulder level and slowly release back to the starting position. Do not stretch your neck forward, as this will place stress on your spine. Use a head rest if provided. 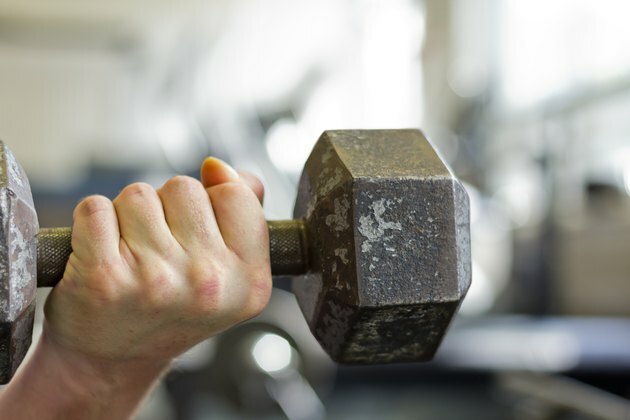 While both exercises target the biceps, the incline dumbbell curl places more resistance on the biceps brachii, which is the largest and most visible biceps muscle. When performed standing or sitting on a stability ball, the dumbbell curl will engage your anterior deltoids and trapezius muscles to help stabilize the movement. You will generally be able to lift more using the traditional dumbbell curl because less tension is placed on the biceps. For both exercises, choose a challenging weight that you can successfully lift for eight to 12 reps. When performing the dumbbell curl while standing, avoid swinging your body for momentum to lift more weight. Such a movement will take emphasis away from training the biceps and could lead to injury. Using a stability ball will engage your core muscles, but will also require a lighter dumbbell weight to be used in order to accommodate the need for stabilization. Ask for a spotter if you are increasing the amount of weight you use. Incorporate both exercises into your training program for best results.